SAN FRANCISCO, Oct. 22, 2014 -- San Francisco State University has been awarded $17.04 million to address issues of workforce diversity in biomedical research, the National Institutes of Health announced today. The effort is called SF BUILD, which stands for Building Infrastructure Leading to Diversity. Professors in biology, chemistry/biochemistry, psychology, geography & environment, and other fields at SF State working on the project are seeking to upend the presuppositions about members of minority communities -- that they may not have the aptitude or the background to excel in the sciences. "We are funded to prime institutional transformation," said Professor of Biology Leticia Márquez-Magaña, the principal investigator for SF BUILD. "Let's fix the institution, instead of fixing the students and not recognizing their assets." The NIH -- the federal agency that conducts and supports medical research, and also investigates the causes and treatments of diseases -- has committed $240 million over five years toward novel approaches that encourage individuals, including those among groups underrepresented in the sciences, to pursue biomedicine. "We have not made substantial progress in supporting diversity," said NIH Director Francis S. Collins. "This program will test new models of training and mentoring so that we can ultimately attract the best minds from all groups to biomedical research." Gather evidence on SF BUILD's approach and practices for raising the level of participation and success for underrepresented students in science. For Márquez-Magaña, SF BUILD is more than about gaining greater representation for its own sake. "Some say we need diversity because we don't have it," she said. "We need diversity because we need multiple perspectives in science, we need the trust of communities, we need to train the next generation of scientists." In examining what is leading minority students to exit the sciences, Márquez-Magaña worked primarily with Professor of Psychology Avi Ben-Zeev and fellow faculty in the College of Science & Engineering to look at "stereotype threat" and the emerging academic literature on its effects. "Being female has a negative stereotype in terms of quantitative skills in math," she said as an example. If a female student were to enter an all-male classroom or lab setting, the potential for prejudices can affect her ability to function at a higher level, according to Márquez-Magaña. "That's why we need to make these classrooms safe, to signal safety so that all students can walk into them and be the best they can be." To respond to the national need for a more diverse pool of researchers, SF BUILD is setting out to reduce stereotype threat in teaching and research -- and increase the graduation rates at the University for underrepresented students in biomedical disciplines from around 20 percent to 40 percent. That will involve training and mentoring for faculty and instructors. In addition, every student in BUILD will participate in a mentored two-year research project and gain skills in interdisciplinary, community-based science. SF State is the lead institution for this BUILD project, and its research partner is the University of California, San Francisco. 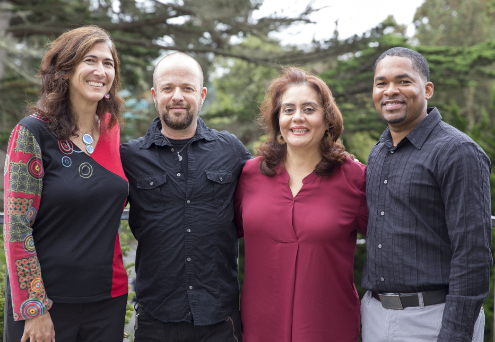 "We are excited to work with SF State on BUILD, a unique partnership that leverages our affinities and strengths," said Dr. Kirsten Bibbins-Domingo, professor of medicine and epidemiology at UCSF and its principal investigator for the project. "BUILD has twin goals of increasing the diversity of the biomedical workforce and also increasing the capacity for innovative research. In pursuing these goals, BUILD has the potential to transform both institutions and enhance our ability to improve the health of all communities in San Francisco." The NIH is funding SF BUILD for five years, with the potential for a five-year renewal. "My drive is based on my experience growing up and my experience at elite institutions," said Márquez-Magaña, reflecting on her life as the daughter of newly arrived immigrants, and as a student at Stanford University and then the University of California, Berkeley, where she earned her doctorate in biochemistry. "The institutions didn't recognize that I had a lot of value that came because I had these other experiences. At the time, I thought something was wrong with me. The value I was bringing was certainly not seen." The proposal for SF BUILD could not have been possible, she added, without Ben-Zeev and colleagues Associate Professor of Chemistry/Biochemistry Teaster Baird Jr., Associate Professor of Geography Tendai Chitewere, Professor of Biology Carmen Domingo and Director of the Health Equity Institute Cynthia Gómez, as well as Assistant Professor of Chemistry Alegra Eroy-Reveles, Professor of Mathematics Eric Hsu, Professor of Biology Kimberly Tanner and other faculty and staff at the University. "We are scientists," noted Márquez-Magaña. "If we gather data, and the data show that our hypothesis [for SF BUILD] is correct -- that the institution needs to change to increase diversity in science -- others will put this into practice." SF State is the only master’s-level public university serving the counties of San Francisco, San Mateo and Marin. The University enrolls nearly 30,000 students each year and offers nationally acclaimed programs in a range of fields -- from creative writing, cinema, biology and history to broadcast and electronic communication arts, theatre arts and ethnic studies. The University’s more than 228,000 graduates have contributed to the economic, cultural and civic fabric of San Francisco and beyond.